When capturing high frequency signals you often require the full bandwidth, sampling rate and memory depth of your oscilloscope. For lower frequency applications, however, the maximum sampling rate of the oscilloscope can be hundreds or thousands of times faster than is required to just acquire the signal. Resolution enhancement is a digital filtering technique that uses this ability to oversample in order to increase the effective resolution (improving the ability to see small changes in the waveform) and to reduce unwanted noise. For this technique to work, the signal must contain a very small amount of Gaussian noise, but for practical applications this is generally taken care of by the scope itself and the noise inherent in normal signals. Resolution enhancement provides similar results to waveform averaging, but has the advantage that it can be done with single shot-signals (waveform averaging of repetitive signals conversely has the advantage that it can be done at the full bandwidth of the oscilloscope). Resolution enhancement is available for all Pico USB PC Oscilloscopes using PicoScope 6 software and can be selected from the Channel Options. It adds up to 4 bits to the effective resolution of a scope. For example, it can boost the effective resolution of a PicoScope 6000 Series scope from 8 bits to 12 bits, and the 16-bit PicoScope 4262 high-resolution scopes can deliver up to 20 effective bits. The resolution enhancement is selectable in increments of 0.5 bit. The resolution enhancement feature is a flat moving-average filter. This acts as a low-pass filter with good step response characteristics and a very slow roll-off from the pass band to the stop band. The table below shows the size of the moving-average filter for each resolution enhancement setting. A bigger filter size requires a higher sampling rate to represent a given signal while preserving high-frequency signals. It is important to understand the effects of using high levels of resolution enhancement. 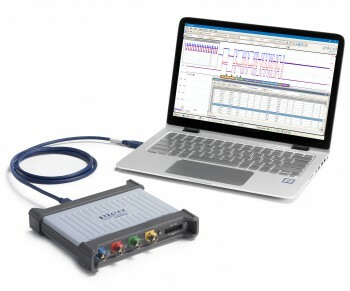 Consider a PicoScope 6404 oscilloscope with a 500 MHz bandwidth and 5 GS/s sampling rate. If you enable 2 bits of resolution enhancement the effective sampling rate is reduced from 5 GS/s to 312.5 MS/s. The current sampling rate and level of resolution enhancement are displayed in the properties pane and it is advisable to check these when using the feature. Note that resolution enhancement is implemented in software. It is independent of the flexible hardware resolution technology of the PicoScope 4444 and PicoScope 5000 Series. Flexible resolution uses a reconfigurable ADC that can be switched between 8, 12, 14 and 16 bits (PicoScope 5000 Series) or 12 and 14 bits (PicoScope 4444).